Lone Survivor – the re-telling of a real-life military operation that took place in 2005 – sees director Peter Berg on a mission to atone for his involvement in Battleship, the multi-million dollar blockbuster flop. He succeeds in part, yet Lone Survivor, no matter how intense and true-to-life it’s brought to the screen, can’t help but feel overblown, particularly thanks to the slideshow epilogue that brings it all to a mawkish close. Four US Navy SEALs – Marcus Luttrell (Mark Wahlberg), Michael Murphy (Taylor Kitsch), Danny Dietz (Emile Hirsch) and Matt ‘Axe’ Axelman (Ben Foster) – are deployed on a mission by their commander Erik Kristensen (Eric Bana) to terminate the life of an influential Taliban operative. However, when the team make a wrong decision under immense pressure, the consequences are soon felt, putting them at severe risk. Undeniably well made, forcible and laced with committed performances across the board, Lone Survivor – based on the non-fiction book by Luttrell and Patrick Robinson – is brutal and effective to a point. Its set up is measured and sure-footed, enabling strong themes of brotherhood and honour to establish themselves, as well as the central foursome – Danny and Axe, in particular – to feel real, rather than mere pawns in a larger design. Yet the more the film unravels, the more it becomes a tiresome and repetitive barrage of bullets and explosions, each more outlandish than the last. That’s not to say that the main attack that exhausts most of its stretched run time isn’t well captured by Tobias A. Schliessler’s claustrophobic cinematography and Berg’s high-powered handheld camerawork, because it is – more that the authenticity is often inflated well beyond belief. The heavy-handed patriotism – epitomised in one drawn-out sequence that sees a Navy SEAL die after an onslaught of bullet wounds atop a scenic cliffside – proves an issue too, though it’s balanced somewhat by an act of humility on the Afghans part that comes towards the end. 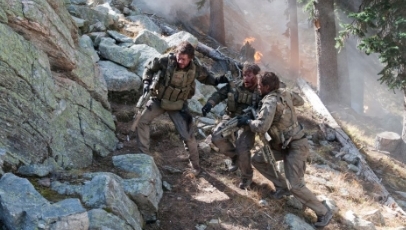 It’s refreshing to see so much humility and heroism in a war film as violent and relentless as Lone Survivor. But ultimately it’s too one-sided and too one-note to be potent tribute it yearns to be.